Green slime – coming soon to a lake near you? The enemy is out there. It is green. It is slimy. Toxic algae outbreaks are a growing problem on our nation’s lakes, and maybe one you love. I’m lucky to live in a county with more than 150 lakes, including the biggest, cleanest freshwater lake in the western United States. Yet even here, we see the nasty stuff. In some lakes near my home, the problem is so bad that dogs can die when they swim in or drink from algae-infested lakes. Toxic algae blooms occur when agricultural runoff, septic tank runoff and other pollution overwhelm bodies of water. Warmer summer temperatures that we see recently only make it worse. 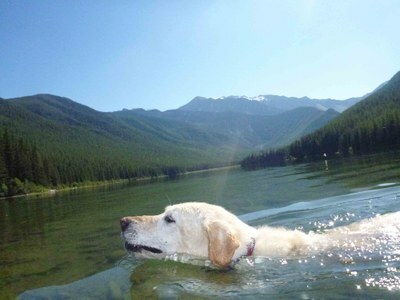 A dog swims in mountain lake. (c) Karen Nichols. My family is just coming off a long, hot summer. Here, relief on hot days means jumping into a lake, paddle boarding, fishing or clowning around with inner tubes. I think every American family should be free to enjoy those things, without unnecessary threats from water pollution. A new, first-of-its-kind national online map by my communications firm Resource Media shows that 21 states across the U.S. have issued health advisories and warnings related to harmful algal blooms at 147 different locations on lakes, rivers and ponds this summer. That’s just a fraction of the actual toxic algae outbreaks happening across the U.S., since not all states even monitor for the stuff. Small ponds, like the one that kills and sickens dogs in my neighborhood, usually don’t get counted. In partnership with the National Wildlife Federation’s Great Lakes Regional Center, Resource Media is also releasing a report, “Toxic Algae: Coming Soon to a Lake Near You?” The report provides a look at how extreme weather and an increase in nonpoint source pollution from agriculture and failing septic systems are spurring its spread. The good news is, we have the technology and know-how to stop this problem. We just need the political will. Education is the first step.